As we enter day 40-something of this heatwave, our latest competition is a MUST enter! Thanks to our friends at Hotpoint our lucky winner will receive a Hotpoint Day 1 FFU3D.1K freestanding frost-free fridge freezer with a whopping 450 litre capacity. Fill with bags of ice, frozen lollies, litres of delectably cold water, ice cold beers, perfectly chilled roséand all you need for an impromptu barbeque and enjoy the weather, knowing your new Hotpoint fridge freezer will be taking perfect care of your food and drink. Read on to find out more about this wonderful prize and how you can enter the FREE competition. 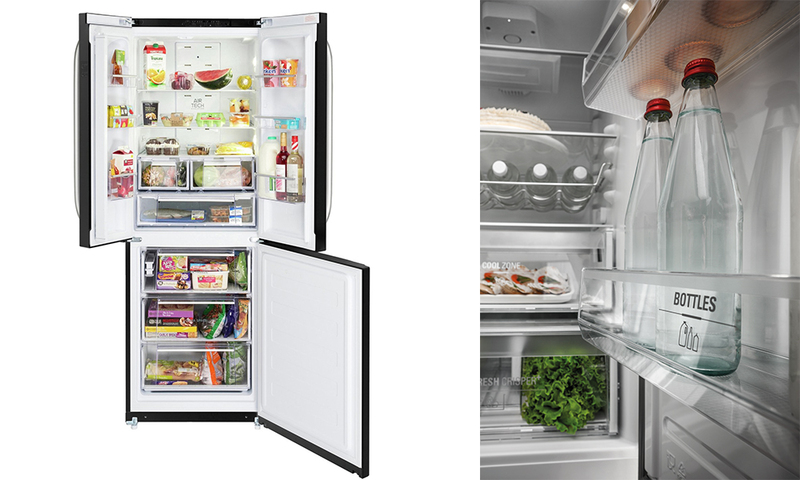 The Hotpoint FFU3D.1K has an impressive 450 litre capacity, with a 60/40 split between the fridge and freezer; this equates to around 25 bags of shopping! Those 25 bags of shopping will be excellently cared for, thanks to Hotpoint’s Day 1 technology. 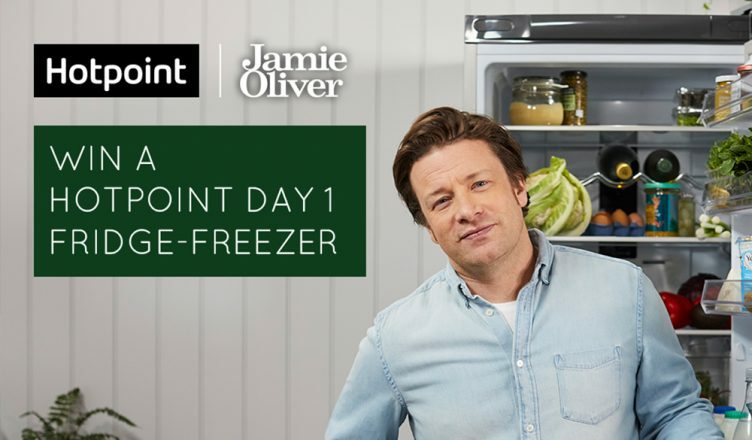 As celebrity chef Jamie Oliver explained, when he teamed up with Hotpoint, “So you’ve filled your fridge with the big weekly shop and just a couple of days later it has started to wilt and gone limp. Hotpoint are taking that pain away with their Day 1 technologies, which create the perfect environment for your food, to keep it fresh for longer.” Considering one third (and rising) of all food produced for human consumption is either lost or wasted, Hotpoint’s innovative approach to cutting down food waste is a great way to benefit your wallet and the environment. 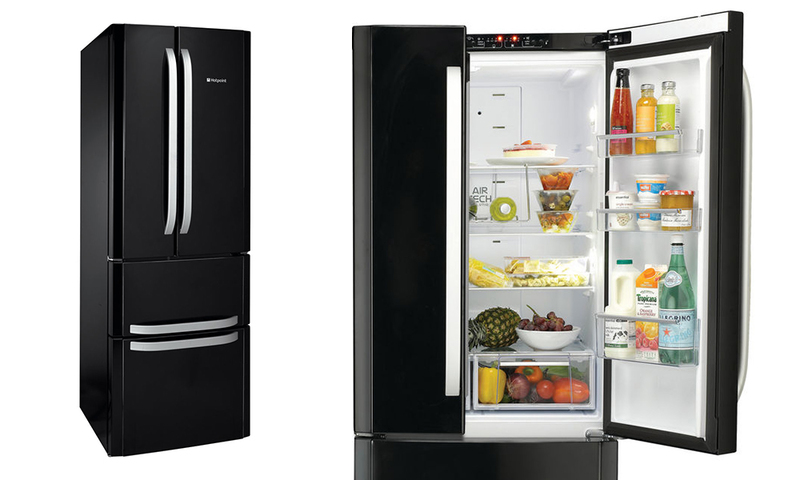 Hotpoint’s Day 1 technology uses various features to create the perfect conditions for the fresh food in your fridge. Thanks to the constant circulation of cold air, the temperature is precisely controlled. Fruit and vegetables are stored at the perfect humidity level in the crisper drawer. When you open the fridge door special oxygen particles are released into the fridge cabinet; this prevents the growth of bacteria, so your food will be remain fresh and tasty for longer. We have one fantastic Hotpoint FFU3D.1K fridge freezer to give away to one lucky winner; to find out more and to be in with a chance of winning just head to our Facebook, Twitter or Instagram pages to find out how you can enter our brilliant FREE competition. You can also buy online, rent this fridge freezer for just £6.23 per week, use our Click & Collect service to collect from your local store in as little as one hour or ask your local store about a demo or viewing our Hotpoint range.